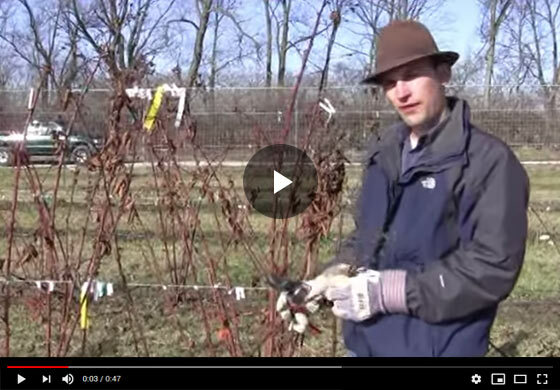 Felix from Gurney's Seed and Nursery shows off a prima cane blackberry plant and explains the basics of early season care of winter-killed blackberries. Hi Felix here with Gurney's and today we're talking about blackberries. We've had a winter here this season there was a little hard on these canes. This happens to be Prime gem which is one of the new prima cane fruiting blackberries. You can see here, we had last season shoot growth and then the fruiting happened in the fall, late summer-fall season, so we had our fruit yield and we've picked that and now in the following spring and what happened this year is when we had some die back from the winters, these canes, you can look and there's a tan interior instead of a nice vibrant green interior, so these canes have died back and had some winter injury, and that's where you run into an advantage with these prima cane fruiting types that you can prune this whole crown down to the ground and you don't lose your whole crop, you're going to get new cane initiation from below ground and you're going to get that late summer-early fall crop regardless of what happened in the winter on these canes. So if you live up in the north where you get a harsh winter more typically, you can grow these prima cane fruiting black berries and enjoy a crop in the late summer-early fall season, even if your canes winter-kill all the way to the ground, this one here, we take back, I mean there's a little bit of green, but really these canes don't look good. It's our pruning attention here, you can see the vibrant green at the very base which was under our snow cover, that's really what you're looking for--some nice, vibrant, green cane integrity. So what we're going to do with these blackberries this year is just trim this all the way back to the ground and then we're going to let it flash and enjoy that late summer-early fall crop, so you know with a normal blackberry, we wouldn't have a crop this year at all, but with these prima cane fruiting varieties like prime gem, those varieties will allow you to have a crop even in a hard winter or if you're in the further north regions, where you get colder, temperatures.